The Content tab of the library shows you all of the content you added to Edgar. The filters at the left allow you to narrow your results. And each library card provides you a preview of that post. Each post in your library will show the post's content, category, link preview or media attached to the post, the social accounts connected to the post, and any advanced settings or variations you added to the post. For details on the variations attached to a post, click the variations icon in the top right corner. Or to see a larger preview of images or video attached to a post, click on the thumbnail. If a post says "No Account" on it, click the Edit button and select the social accounts you want to publish the post to. Then save it. Posts labeled "No Account" will not be published until accounts are connected to it. Clicking the History button on a post will show you the publishing and click tracking history for that post. To delete a post, locate the post in the Library and click Delete. 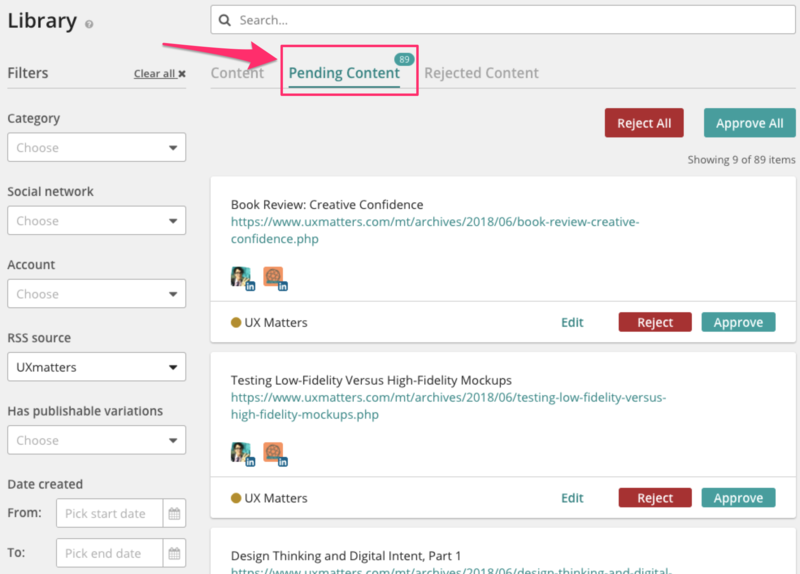 The Pending Content tab of the Library displays the content that has been imported from your RSS feeds and is waiting for approval. Content on this tab will not be published until it has been approved. Learn how to import content automatically from RSS feeds here: Import from RSS. 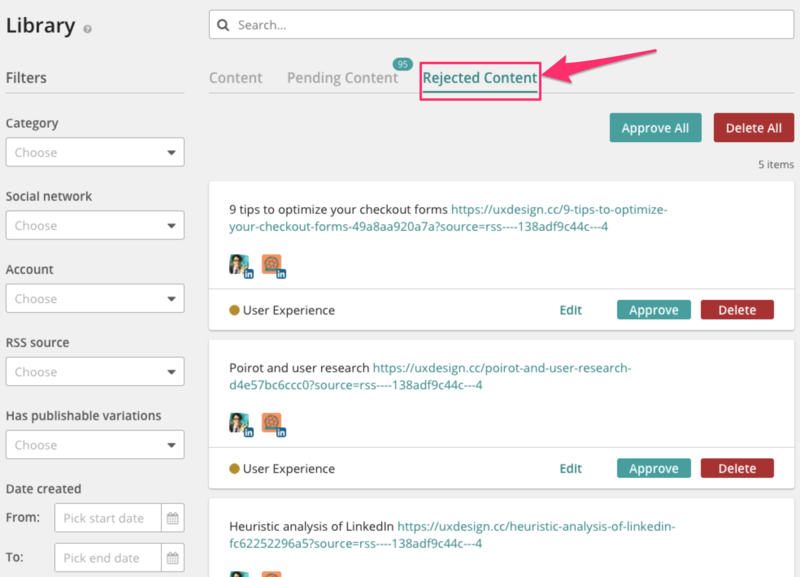 Click Edit to make changes to a post prior to approving, or click Approve to move the post to your Library. If you don't want a post, click Reject to send it to your Rejected Content tab. 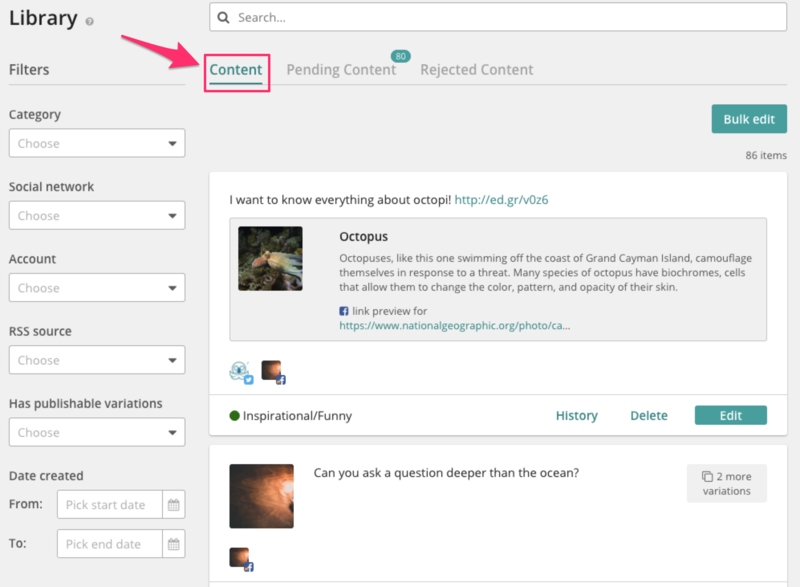 RSS content that you deleted from the library or rejected from the Pending Content tab is moved to the Rejected Content tab. It is not necessary to clear content from this tab. Just leave the rejected content there so Edgar knows not to import it again. Removing content from this tab may result in it being imported again in the future. If you decide you do want to publish a rejected post after all, you can edit or approve it from this tab. The search bar at the top of the library allows you to search your library by keyword. 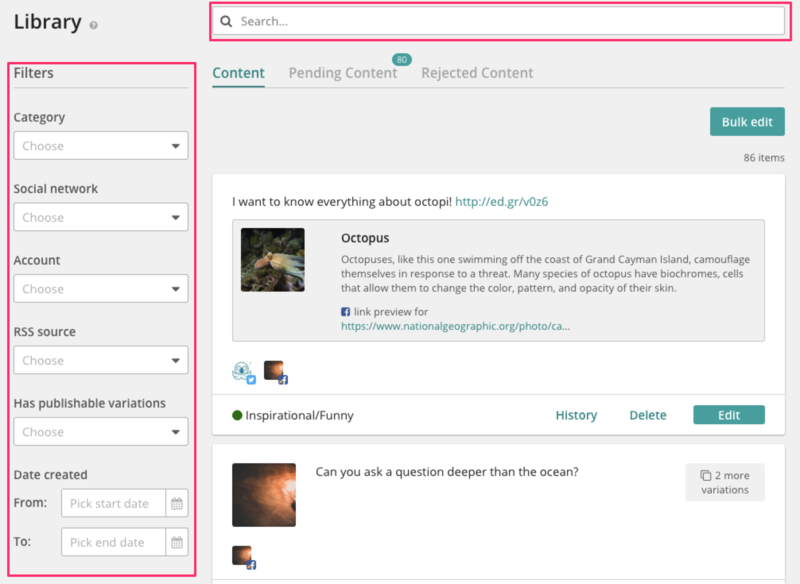 And the filters at the left allow you to narrow your results to locate specific content. You can apply multiple filters at once to be as specific as you need. RSS source allows you to see only content imported from a specific RSS feed. Has publishable variations shows you content that has unpublished variations and is still in the posting rotation. Combine the No option with the Social Network filter for Twitter to see which of your Twitter posts need new variations to keep publishing. The Account filter has a "No Account" option. This will show you any posts that are not connected to your social accounts. Edit these posts to connect your social accounts. They won't be published until you do! Bulk Edit allows you to change category or account connections, designate posts as Use Once, or delete posts in bulk. Please be careful when making bulk edits and especially when deleting posts in bulk. This action cannot be undone. Always use the filters to narrow your results before making changes. Still need help? Message us by clicking on the speech bubble to the right!